I guess it’s a tradition that every once in a while students revolt against the economics they are being taught. When I was doing my PhD it was a movement calling itself “post-autistic economics”, which was mainly active in France, but also got support elsewhere. I agreed with some of their complaints, although the argumentation was not always that strong and sometimes outright politically motivated (“Capitalism boo! Neo-feminist post-constructionalism yay!”). Later on they changed the name to “Real-World Economics”, perhaps not to offend people suffering from autism. Looking at their review I still don’t get the impression that they’re making much of a dent in the economics debate. Neither am I convinced by what they write, to put it politely. But now a new revolt has emerged in Manchester. As far as I can see it is more constructive, and more well-argued than the post-autist movement. I agree with some of their points, but not all. I agree with their proposition that economics teaching should take heed of insights from such fields as psychology, law, and policy science. I don’t know the Manchester program, but I find it curious that such subjects receive as little attention as the Manchester economics students claim. Besides microeconomics, macroeconomics, and econometrics, students in our BSc Economics and Governance program take courses and lectures on history, policy science, institutional economics, and behavioral economics. I guess it’s a question of discussing one particular model or theory very thoroughly, or discussing several different models or theories in a more shallow manner. Our Economics and Governance BSc chooses to be broad, and I agree with that, especially for a problem-oriented university as Wageningen. I also agree with the Manchester students’ call for a more evidence-based economics, and more attention for the conditions under which different theories and models have more explanatory power than others. In my humble opinion economists must get rid of schools. We should treat our theories like ecologists treat their models: to paraphrase George Box, our models are always wrong in some respect, but they may be useful in some cases. The challenge is to identify the conditions under which they can be useful. Go here for the very first peer-reviewed article of our former MSc student, Matteo Zavalloni. The article quantifies the trade-off between two different alternative uses of a mangrove ecosystem and finds that it is crucial to take into account spatial links in this process. The general idea behind the paper is that a mangrove ecosystem can serve many different purposes, but as space is limited you cannot have them all: in other words, we have a typical economic problem of satisfying wants under limited resources. In his paper Matteo (and I, and Paul van Zwieten) focused on the trade-off between two uses: cultivating shrimp in aquaculture ponds; or providing nursery habitat for juvenile wild shrimp. There is a lot more to mangrove ecosystems than just those two functions: tourists also like to come to mangrove forests (I loved the mangrove forest in Ca Mau, for example), and mangroves also form important coastal protection. In this paper, however, we wanted to explore some methodological issues in a spatially explicit manner, and these two uses were the most appropriate for this analysis. In economics lingo we call this a production possibilities frontier (PPF). 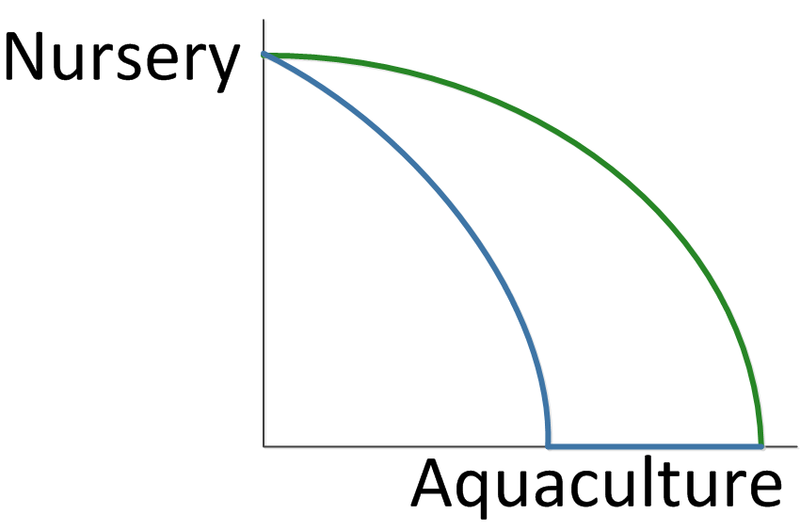 It shows all combinations of two goals (in this case aquaculture production and nursery habitat) that are maximally attainable. Combinations above the curve are impossible to attain; combinations below the curve are feasible, but not very efficient. Note that the left picture has all aquaculture clustered together in the west corner of the study area, whereas the right picture has aquaculture located along the water course, blocking the mangrove forest from access to the river. 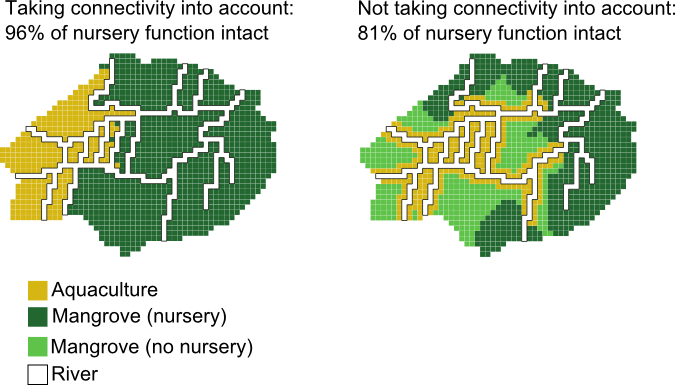 The reason is that farms near the river have lower transport costs, but the consequences for the nursery function are not taken into account. So how does this help us? First, we wanted to demonstrate that conservation, no matter how noble, has costs, and that those costs should be considered in policy decisions. Second, it illustrates that functions can be combined if you use your information wisely. The approach we developed is one small step towards methods to find the best compromise between different interests in coastal zones. On the day that the Dutch commemorate their liberation from Nazi Germany. With all the attention going to the Second World War you’d almost forget that this year is also the sad 20-year anniversary of the slaughtering of up to a million Tutsis. I know the Rwandan genocide took place on another continent, whereas the Holocaust happened on our doorstep, so the Dutch could be forgiven for focusing on their own history. Nevertheless, it feels uncomfortable how easy the West seems to forget about one of the most recent, and intense, ethnic cleansings. Every year, when I remember Auschwitz, I also think of Rwanda. And Srebrenica. Because our commemoration of freedom coincides with the commemoration of the Second World War, the Dutch have a tendency to equate freedom with peace. I consider that too simplistic. If you ask me for my definition of freedom, I would say: the right to deviate. I consider individual rights one of the most important institutions that make us free. Even in a democracy, we need institutions like individual rights to protect us from the government. Without inalienable individual rights, democracy collapses to majoritarianism: two wolves and a sheep voting on lunch. Days like Liberation Day should remind us that although it sometimes feels uneasy or unjust that even the bad guys have individual rights to protect them from the government, the alternative is worse. Just so that next time a criminal gets acquitted because the evidence was acquired through illegal means, we remember what the world would look like if the cops were above the law. Another reason why I disagree with the “freedom=peace” simplification is that we did not get rid of the Nazis by asking them politely. People were killed. Not just soldiers, but also civilians – my grand parents barely survived the infamous Bezuidenhout Bombing by the Royal Air Force. It’s a painful truth that war – any war – kills not only the bad guys, but also lots and lots of innocent people. Nevertheless, we have forgiven the RAF for its mistake (the Brits were quick to offer their apologies after they realized they bombed civilians, not V2 rockets), and we are still grateful to the British (and the Canadians, the Americans, the Polish, and all other Allied Forces) for liberating us. Had those soldiers not taken the unimaginable risks they took, we would “all be speaking German” as some would have it. Therefore, I believe that veterans – all veterans, not just WW2 veterans – should be an integral part of the Liberation Day events. To thank them, and to honour those who died in service. That even includes the veterans who fought (and died) in wars we now perhaps think we should not have gotten involved in, like the Indonesian war of independence or the 2003 Iraq war. The Dutch still refer to the Indonesian war of independence as the “Politionele Acties” – a preposterous whitewash of a shameful history if you ask me. The Indonesians deserved to be independent of their colonial masters, and we had no right to govern them. Nevertheless, the soldiers who went were not the people who made the decisions. Only a few had the courage to refuse to go, and their refusal was considered high treason at the time. Americans treat their veterans with a lot more respect than the Dutch do. When I was in Santa Barbara during Veteran’s Day I read a letter in the local newspaper by a Californian of German-Jewish descent. He explained how American soldiers rescued him, a little kid more dead than alive, from a concentration camp. He stayed with them because he could translate between German and English, and eventually went with them to the USA and became an American citizen. He wrote the letter to express his gratitude to all American veterans, and to the United States in general, for granting him a new lease on life and his freedom. I never forget that story.